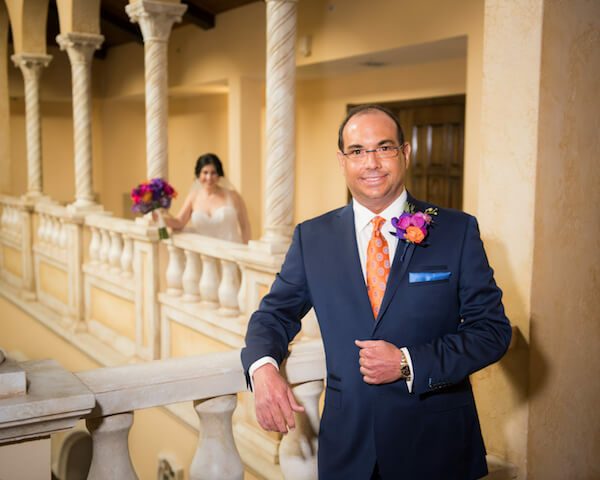 The Special Moments Event Planning team loved infusing bold, brilliant colors and stunning details into this Tampa Bay area Moroccan wedding with a traditional Jewish wedding ceremony. 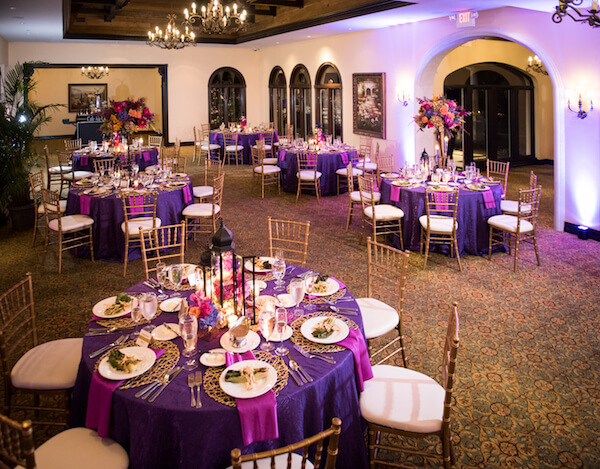 Bright shades of purple, fuchsia, pink, and gold tones filled the entire Avila Gold and Country Club space. 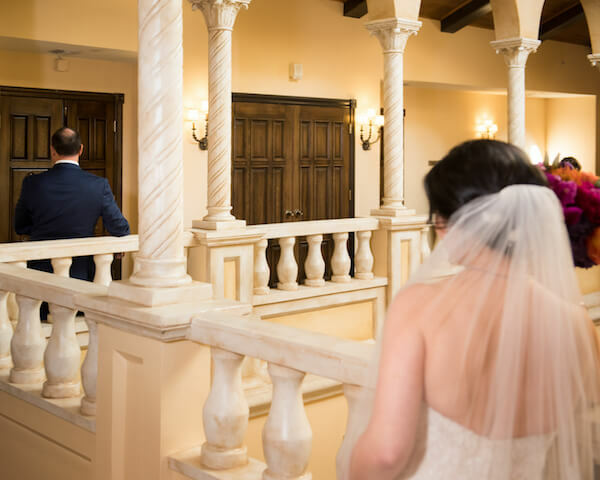 Prior to the traditional Jewish wedding ceremony, Jeff saw his beautiful bride for the first time. 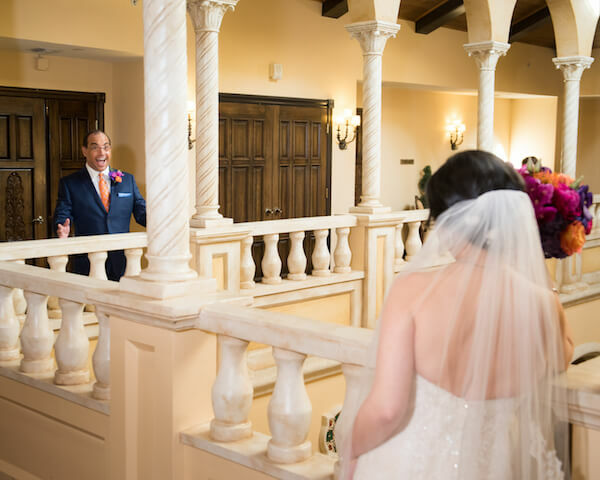 Jeff was standing in the huge wrap around balcony overlooking their ceremony space and Audrey made her way up behind him, and to say he was blown away might be an understatement. 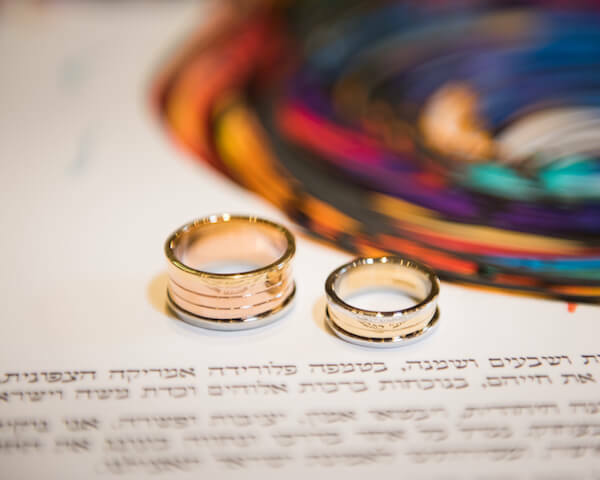 The couple began the wedding ceremony signing their ketubah, which was an amazing piece of art. 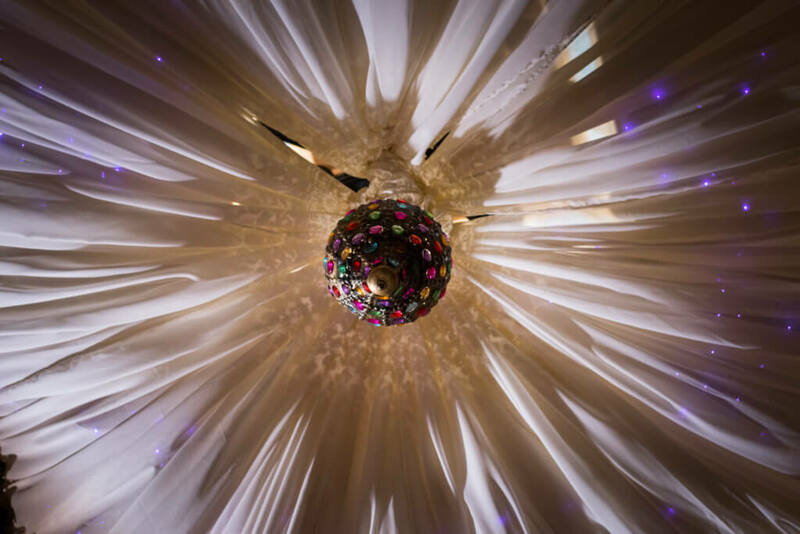 The centerpiece of this amazing wedding was the couple’s Ceremony in the Round. 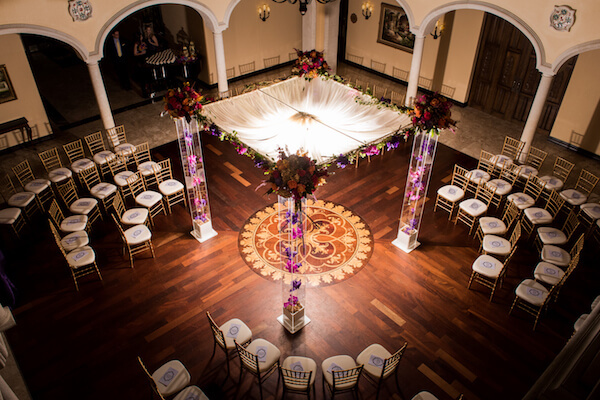 Gold chivari chairs surrounded a chuppah composed of four clear columns overflowing with crystals, brightly colored flowers and topped with a soft flowing white cloth. 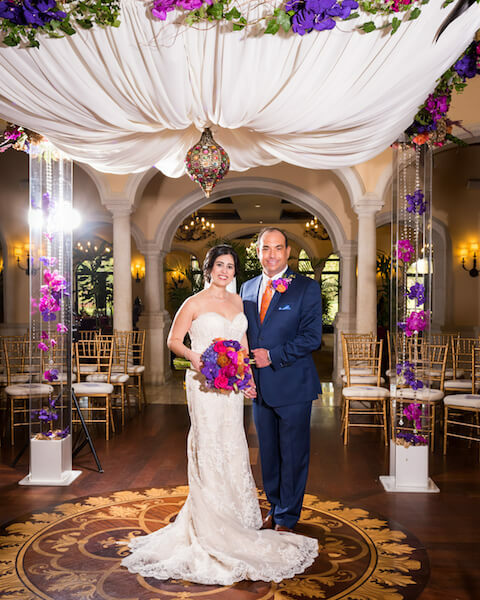 The underside offered an equally spectacular view with a brightly colored Moroccan style jeweled lantern reflecting colored light across the pleated white chuppah covering. 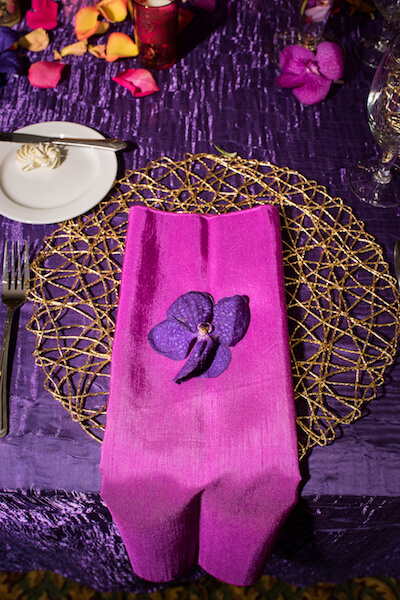 The reception continued this awesome bold color palette with bright purple iridescent crush linen on the reception tables. 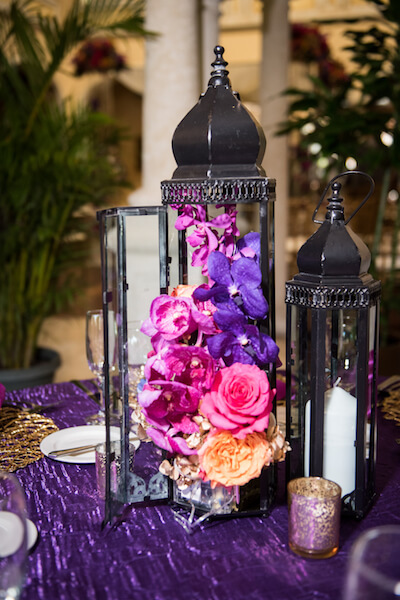 Mixing the metals in the black iron lanterns filled with jewel tone flowers and the shimmering bronze charger plates added textured elements. 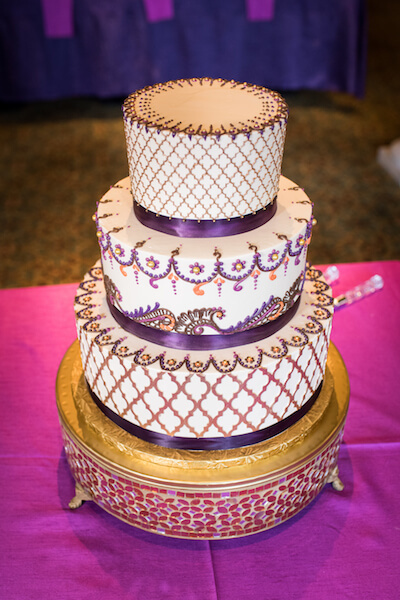 The breathtaking three-tiered wedding cake was ornately detailed in purple, black and gold incorporating traditional Moroccan tile and fabric patterns with just a touch of crystal for some shimmer. 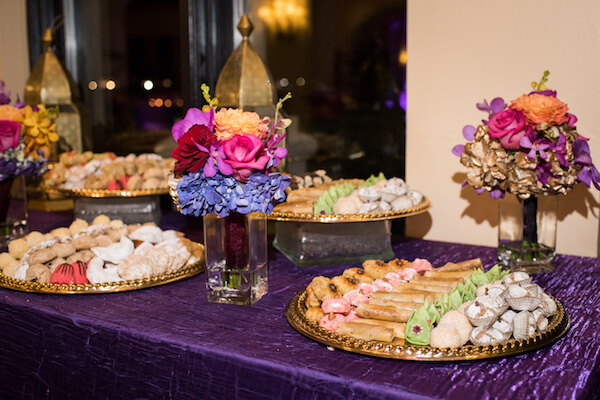 The evening ended with guests enjoying a table full of delicious homemade Moroccan sweet treats. We used Special Moments for Day of Planning. 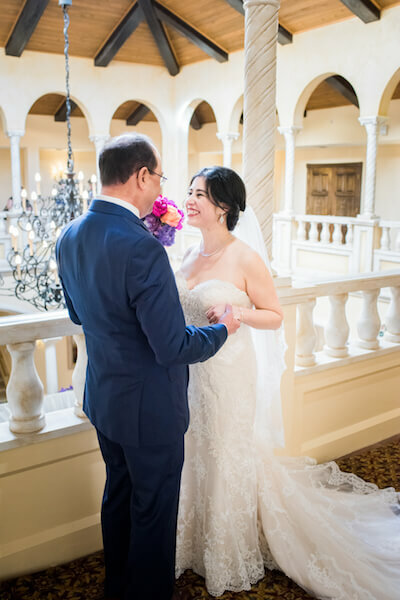 We had started planning ourselves, but learned about Tammy and are very happy that she was able to work with us. She helped along the way, promptly answering all of our questions and emails. Week of, she kept me calm and worked with all of our vendors for a day of timeline. Day of was amazing! I didn’t have to do anything other than get to the venue, have my hair/makeup done and get dressed! Even after our guests left, I was preparing to start packing our stuff, but she and her assistant, Petra, had everything done! Save yourself a lot of headaches and hire Special Moments. Had we known about her sooner, we probably would have had her take a bigger role in the planning! 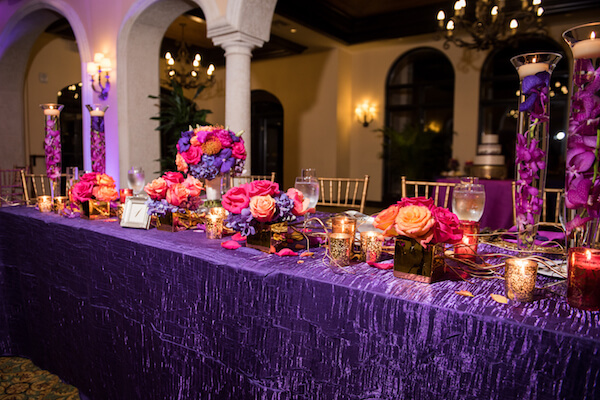 Thank you to all of the amazing Tampa Bay wedding vendors who brought this brilliantly colored wedding to life.